Vegetable noodles is a famous Chinese dish.It is most popular in everyone mostly in kids.Water goes into our mouth when we hear a name of noodle.In this spicy noodles i use a many kind of vegetables to make it tastiest.It is very easy to prepare.I give you a step by step procedure to make a noodles. Boil noodles with 1 tbsp oil and after boiling wash it with cold water. Now take a pan ,add 3 tbsp oil and add onion in a pan. When onion became light brown then add capsicum, cabbage, carrot and green chilli in it. Fry them for 3-5 minutes. After fry them,add soya sauce, chilli sauce, tomato sauce, garam masala, black pepper and salt. 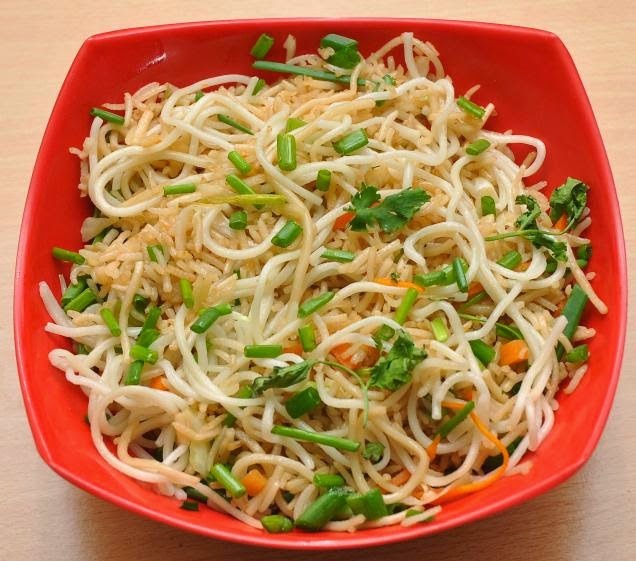 After this add a boiled noodles into this. .
Add a noodles into a bowl or serving plate and garnish it with finely chopped coriander and serve with a tomato sauce.